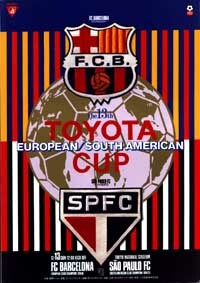 The 1992 Intercontinental Cup was a football match played on December 13, 1992, between FC Barcelona, winners of the 1991–92 European Cup, and São Paulo, winners of the 1992 Copa Libertadores. The match was played at the National Stadium in Tokyo. It was Barcelona's first appearance into the competition. São Paulo won the match 2–1. Raí was named as man of the match. ^ "Toyota Cup - Most Valuable Player of the Match Award". Retrieved 2009-10-22. This page was last edited on 20 April 2019, at 13:17 (UTC).